As a child, Theo Heser was a loyal member of the Hitler Youth. But decades later, haunted by the horror of the Holocaust, he converted to Judaism. As a young boy, growing up amid the nationalist frenzy of Nazi Germany, Theo Heser idolised Hitler. When the fuehrer came to his hometown of Munich to visit, Theo and his father were at the front of the crowd reaching out to touch his hand. "I know if I was able to shake his hand I probably wouldn't have washed for a few months," he recalls. Seventy years later, in a bid to come to terms with his Nazi past, Theo has become a Jew. "I wanted to be part of a community, this was something I had never felt in my life," he says. "I wasn't running away from something, I was joining something entirely new." Theo had a happy childhood growing up in Germany. 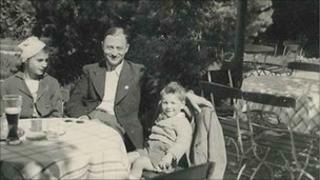 Along with his sister, who became a youth leader, he was a loyal and eager member of the Hitler Youth. His father was quite high up in the Nazi party. "Hitler, as far as he was concerned, was the best thing since sliced bread," Theo remembers. As a young child he was entirely oblivious to the fact that the society he was part of was complicit in the murder of millions of Jews. "Nothing that had anything to do with the Holocaust was spoken about," he recalls "It was just like it never happened." The genocide that was taking place, he says, had no discernable effect on his family or the community he lived in. It wasn't until some years later that he began to feel the burden of collective German guilt that haunted many in the post-war years. In the 1950s he left Germany for Britain where he set up a successful catering company and later met and married his second wife, Patricia. Growing up in a Jewish community, though not a Jew herself, Patricia had chosen to convert to Judaism. Before meeting Patricia, Theo didn't have any Jewish friends and with disarming honesty admits that he probably wouldn't have wanted any. "I grew up in an anti-Semitic surrounding, I probably myself had anti-Semitic views but it never ever came to the discussion," he acknowledges. "So I had nothing to do with Jews." All that changed when he was invited to travel to Israel with his wife and a group of Jewish friends. On their first night in Jerusalem Theo was having trouble sleeping and walked over the window of his hotel room to look out through the curtain. "It was almost as if I was struck by lightning," he recalls. Below him was Jerusalem's holiest place for Jews, the Western wall. The golden Dome towering above it and glistening in the night sky. He watched as the sun rose over the dome, sitting there transfixed for six or seven hours as the beautiful stories of the Old Testament he had heard as a young Catholic altar boy in Munich flooded back to him. The emotional effect was profound and when he returned to the UK he knew exactly what he needed to do. When Theo approached his local rabbi to tell him he wanted to convert, the holy man simply said: "What took you so long?" The conversion process took four years, throughout which Theo had to learn Hebrew and study the Torah in depth. During that time the horror of what his countrymen had done to Jews started to hit him. "There is always behind this tremendous feeling that I just cannot understand what my people did to the Jewish people, it really upsets me." Before the conversion ceremony took place, he made an unusual request - that he receive a mikveh or ritual bath. "I almost nearly drowned myself in the place because I felt there was just so much inside me that I needed to wash away," Theo says. But even going to this extreme wasn't quite enough to ease his conscience. Even after the conversion ceremony Theo felt an intense need to solidify his belonging to the Jewish community. He decided to have a Bar Mitzvah, the coming of age ceremony normally celebrated by boys in their early teens. He was 62. As he stood at the front of the synagogue to read from the Holy Book he grabbed the traditional wooden podium and declared: "Now, I'm a Jew." He was harking back to the time when John F Kennedy came to Berlin and put his hands on the Wall declaring: "Ich bin ein Berliner"- I am a Berliner. "That at the time was so powerful. I wanted to do something similar." Since his conversion, Theo has been travelling from synagogue to synagogue teaching children and adults about the Holocaust. When he talks to a congregation, he asks them: "Am I or am I not a Jew?" Each time he gets the same answer: "Don't worry Theo, you are one of us." "That," he says, "is all I really wanted."